Logline: Cowboys and Indians team up to fight off a group of invading aliens set out to destroy Earth. Cowboys & Aliens is an 2011 American science fiction Western film starring Daniel Craig, Harrison Ford, and Olivia Wilde. The film, directed by Jon Favreau, is based on the 2006 graphic novel of the same name created by Scott Mitchell Rosenberg, which in turn was an expansion of a Far Side comic by Gary Larson. 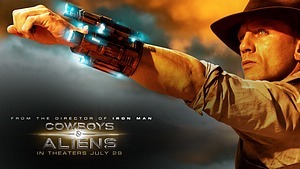 Cowboys & Aliens was released in the United States and Canada on July 29, 2011, and in other countries on ensuing weekends.